I'm not sure what about this Ann Taylor Briston Two-Tone Espadrille Platform Pump that first caught my attention but I know I am enamored with these espadrille-inspired peep-toe platform heel; why did I fall in love with it? 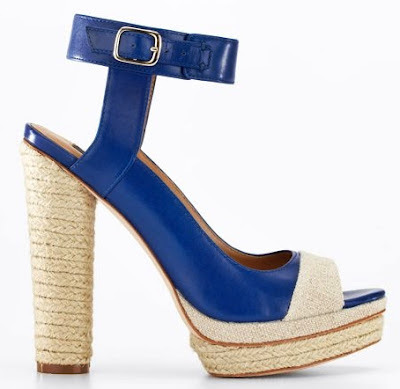 It may have been the brilliant cobalt blue leather against the natural canvas, the 5” with 1” espadrille-covered platform heel or because it's Ann Taylor and it can be worn for work and play. Either way, it was love at first sight and I'm sure you also "oohed" when you first saw the above photo. Featuring an adjustable buckle and a padded leather footbed for complete comfort, this peep-toe heel is a must add to your wardrobe. OOOO loving those Ann Taylor is really stepping up their game. I always found Ann Taylor older looking but they def. Have changed their style for a more younger vibe but still keeping it tailored.